Charlie Watts will be performing with Axel Zwingenberger, Ben Waters, Dave Green and more in Prague Jan 10, Bad Ischl Austria Jan 11 and 15, Munich Jan 12 and Herisau Switzerland Jan 13. For more info and tickets see the Ben waters gigs list. Thanks to everyone for this year. Have a nice Christmas and New Year, and play your Stones records loud if you can. Merry Christmas - Bon Noel - Fr�hliche Weihnacht - Prettig Kerstfeest - Feliz Natal - �Feliz Navidad! - Wesolych Swiat - Gle�ileg J�l - God Jul! PS. It seems like 2010 might be a new great Stones year. They say the Stones will tour... again! The new It's Only Rock'n Roll magazine issue IORR 61 was mailed out earier this month, and should have arrived to all subscribers by now. The magazine is including unique photos, interviews, reports and more. For information about how to subscribe see the Get IORR pages. Ronnie Wood was released on bail today after being arrested on suspicion of domestic assault. He was arrested near his home in southern England yesterday and spent the night in police custody before being released. "I can confirm that there was an incident last night and that Ronnie Wood was arrested," a spokesman for Ronnie said, adding that he did not have any further details. See the CNN story Ronnie Wood accused of domestic assault, the Daily Mail story, and the IORR forum discussion Ronnie arrested. Rumours are telling the Rolling Stones are planning a new world tour starting in Europe next year. The legendary UK festival Glastonbury might be one of the highlights next summer, before they move on to America and the rest of the world. Mirror in UK have published a list of Top 10 Stones covers. See the list with video links: Susan Boyle, Oasis, U2 and the top ten Rolling Stones covers. The Rolling Stones have reissued their hit "Wild Horses" following Susan Boyle's rendition of the song on the British TV show "The X Factor" last night. A digital package featuring the original song plus a stripped-down version taken from the band's 1995 live album "Stripped" has been released on major download sites today. A video of the band performing the song at Knebworth in 1976 is also included. Boyle's version of "Wild Horses" is the opening track of her debut album, "I Dreamed A Dream", which is released today. Ronnie Wood has been honored for his outstanding contribution to his genre at the Classic Rock Roll Of Honour Awards. See the Telegraph article Rolling Stone Ronnie Wood honoured for outstanding contribution to rock and Ronnie Wood photo by AP. Mick Jagger was on stage with Bono and Fergie last night at the second night of the 25th anniversary of the Rock and Roll Hall of Fame. The event took place at Madison Square Garden in New York City. First Mick did "Gimme Shelter" with Fergie taking over the parts Lisa Fischer use to do on stage with the Stones. Then Mick did a duet with Bono on "Stuck in a Moment You Can�t Get Out Of", before U2 closed it all with "Beautiful Day". For details and pictures see the IORR thread Mick Jagger at Rock & Roll Hall of Fame 25th Anniversary show and the Rolling Stone report Hall of Fame Anniversary Rocks on With Second All-Star Night. Bill Wyman joined in with Ronnie Wood and the Faces during a charity show at Royal Albert Hall in London, UK last night. See the IORR thread The Faces one-off reunion, October 25 2009. Keith Richards got a standing ovation at the Greek Theatre in Los Angeles, as Johnny Depp presented him with the Rock Immortal award Saturday Oct. 17. This was part of the Scream Awards, where fans voted online. "Scream 2009" will be edited into a two-hour special set to air on Oct. 27. See the AP report Depp, Richards light up Spike TV's 'Scream 2009' and the IORR thread Keith at Scream Awards (photos). There are rumours in Czech press about Mick Jagger and other celebrities taking part in the celebration of the 20th anniversary of the Velvet Revolution. See the Radio CZ report Star-studded concert and re-enactment of November �89 march among events planned for 20th anniversary. Charlie Watts will be performing with Axel Zwingenberger, Ben Waters, Dave Green and more at The Bulls Head, Barnes, London, UK on Monday November 16. For tickets see The Bulls Head gigs list. Tickets for the legendary UK festival Glastonbury 2010 sold out fast as rumours once again are telling the Rolling Stones might headline the festival. Still long time Stones fans do know the fact that the Stones do not perform at shows or festivals unless they are already on tour. See the AFP story Rolling Stones favourites to rock Glastonbury. Charlie Watts will be performing with Axel Zwingenberger, Ben Waters, Dave Green, Jools Holland and Lila Ammons at the St. Pauli Theater in Hamburg, Germany on Oct 12. See details about Die St. Pauli Boogie Woogie-Nacht. Ronnie Wood joined in with his son Jesse and the band The Black Swan Effect, as they performed a promotional show for the Guinnes Brewery at a shop window in Grafton Street, Dublin, Ireland yesterday. See report and photos in the Daily Mail and the IORR thread Ronnie Wood playing in Grafton Street. Susan Boyle, the amateur singer who took the world by storm earlier this year with her appearance in Britains Got Talent 2009, is expected to do a cover version of the Rolling Stones classic 1971 song "Wild Horses" at the opening of the USA version of the same show next week. Check out her studio version of "Wild Horses" on the Susan Boyle Fan Club USA, from an album due out in November. Mick Jagger and Charlie Watts were spotted together as they atttended the England vs Australia cricket game in London earlier this week. See the Mail online article Lily Allen plays tea lady as she watches cricket with The Rolling Stones plus more photos and comments on the IORR thread Mick and Charlie at Lords. Charlie Watts has been guest playing with Ben Waters in UK this week, most recently on Friday in Southampton at the Eastlegh Concord Club. See great photos in the IORR thread Charlie... September 4th. The "Get Yer Ya-Ya's Out!" 4CD deluxe box rerelease due out on on Nov. 3 will include unreleased audio and video recordings of the songs Prodigal Son, You Gotta Move, Under My Thumb, I'm Free and (I Can t Get No) Satisfaction. See more details in the IORR pages Get Yer Ya-Ya's Out! The Rolling Stones 2009 Edition. Keith has been recording a couple of tracks with Jack White recently. Now the next project for Keith is studio works with the Rolling Stones. If Keith Richards has his way, the Rolling Stones will start working on a new record next year. �I�m trying "One way or another, I�ll get them back in line. ", Keith says. See the Rolling Stone story Keith Richards on Recording With Jack White, New Rolling Stones LP. Keith Richards and Mick Jagger have been working with Universal to pick Exile outtakes for the deluxe release due out in November. "There�s new songs on there, stuff we�ve forgotten about," Keith says. "Mick and I were looking at each other like, 'Ah, did we do that?'" See the Rolling Stone story Keith Richards on Recording With Jack White, New Rolling Stones LP. The legendary Rolling Stones 1969 live album "Get Yer Ya-Ya's Out!" will be released as a 4CD deluxe box set by ABKCO on Nov. 3. More info is expected soon. See album entry on Amazon: Get Yer Ya-Ya's Out! The Rolling Stones In Concert [40th Anniversary Deluxe Box Set]. A fabricated news story on internet about Charlie Watts has made headlines in media across the world. The story is false, and it has been denied by the Rolling Stones. This is their official statement: "Contrary to a fabricated story that ran this morning on a small music web site in Australia, drummer Charlie Watts has not left The Rolling Stones." Follow thousands of worried Stones fans on this case in the IORR thread Charlie quits? False rumour!. Forty years after the body of Brian Jones was found in his swimming pool, British police said Monday they are reviewing new evidence about his death turned over by an investigative journalist. See the AP report UK police to review Rolling Stones guitarist death. Last night in London Pearl Jam broke out rarities and brand new songs at a fan club only show in the legendary London Shepherd�s Bush Empire. Ronnie Wood joined in on stage early on for "All Along the Watchtower", and returned later on for "Even Flow". See the Rolling Stone report Pearl Jam Break Out New Songs, Rarities, Ronnie Wood in London, and the IORR thread Ronnie playing with Pearl Jam at Shepherds Bush. Falkenberg Sweden will arrange their 2nd annual Stones festival on Saturday August 1, with great cover bands and Stones music. See their web site Stonesfestivalen. Classic photographs of the Rolling Stones at the Hollywood Bowl July 25, 1966 has been made available by California-based photographer Sue Michelson at the web site RollingStones1966Photos.com, to coincide with the forty-third anniversary of the legendary concert. For press release and more details including guitars amnd more see the IORR thread Stones at the Hollywood Bowl '66. Another great book by Stones fans and experts Olaf Boehme and Gerd Coordes is out this summer. Subject of the book is Shine A Light press cuttings and more. German and international press cuttings, a true product made by fans for fans. For details and how to get the book see Shine A Light by Olaf Boehme and Gerd Coordes. Mick Taylor would like to bring the following message to his fans: "It is with deep regret that I must announce that the US and Canadian dates scheduled for July and August will have to be cancelled, due to health concerns. During my stay in hospital, my physicians have determined it would not be safe for me to travel at this time. I do hope to return to the US and Canada in the future, to sing and play for you." For updates please see micktaylor.net. Tom Keylock, Rolling Stones fixer, died on July 2, 2009, aged 82. Tom Keylock played a crucial part in the turbulent 1960s history of the Rolling Stones. Initially employed as a chauffeur, he swiftly became indispensable as the band�s most trusted all-round �fixer�. Dubbed �Mr Get-It-Together� by Keith Richards, his duties expanded to include bodyguard, cook, road manager, procurer and much else besides. See the Times report Tom Keylock: Rolling Stones fixer and the IORR thread Tom Keylock Dies. Charlie Watts will be performing with Ben Waters, Axel Swingenberger and Dave Green in London Tuesday Sept 1 at the Royal Festival Hall, Wednesday Sept 2 at Milton Keynes - Wavendon The Stables, Thursday Sept 3 at Crawley - The Hawth Theatre and Friday Sept 4 in Southampton - Eastlegh Concord Club. See the Ben Waters list of gigs, and reports from Charlie Watts with Ben Waters at 100 Club earlier this summer. Allen Klein died today after a lengthy battle with Alzheimer�s. Klein became the co-manager of The Rolling Stones in 1965. By the late 1960s the Stones decided to set up their own business structure in 1970; however, a legal settlement meant giving Klein the rights to most of their songs recorded before 1971. See The Independent report Allen Klein: Notorious business manager for the Beatles and the Rolling Stones. Ronnie Wood joined in with Slash on stage at the Quart Festival in Kristiansand Norway tonight for the four songs "Honky Tonk Women", "Stay With Me", "Knocking On Heavens Door" (dedicated by Slash to Michael Jackson) and "It's Only Rock'n'Roll". For details and photos see the IORR forum thread Ronnie Wood with Slash at the Quart Festival. Tim Ries is coming to Europe for three weeks this summer. But before that, he will be performing at the Highline Ballroom in New York City tomorrow. Bernard Fowler will be with Tim at all the shows, while Lisa Fischer, Darryl Jones and Michael Davis will be at some selected shows. For details see Tim Ries gigs 2009. Charlie Is My Darling will be out on DVD by August 3 in Europe. The movie is filmed during their Irish tour of 1965. It follows The Stones through the highs and lows of life on the road, including interviews with the band, backstage footage and a jamming session. But... the original live music is not present. See details on the IORR Forum thread Charlie Is My Darling DVD. Ronnie has been recording solo stuff in Los Angeles this winter, Mick has been actice recording in LA as well recently, and Keith has been doing stuff in New York City. Charlie is guest playing at shows in London this spring, and Stones backup musicians are warming up as well. Rumours are they are getting ready for a world tour, to be announced some time later this year. The Rolling Stones, Amy Winehouse, Fall Out Boy and The Killers have joined hands to record a new covers album to raise money for charity. The Rolling Stones will contribute with The Drifters' "Under the Boardwalk". The album is due out July 9. See the newKerala.com report Rolling Stones, Amy Winehouse, Killers team up for climate change charity. 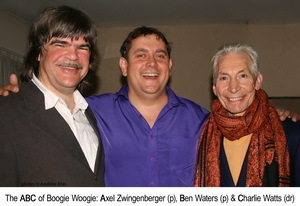 Charlie Watts will be appearing with Ben Water and Axel Zwingenberger at the 100 Club in London, UK on Saturday June 13. See 100 Club tickets and the IORR thread Charlie Watts at the 100 Club. Blondie Chaplin will be performing at the Universal Records remasters release party at the Hard Rock Cafe in Oslo, Norway, Sunday June 14. The event will be a special IORR party with Stones quiz and Stones fans get together, twilight fun in the midsummer days of Oslo. Please see details in the IORR forum thread of Blondie Chaplin show details. Rolling Stones backing band musicians are busy on the live scene these days. Check out coming events with Tim Ries in Paris, Lisbon and New York City, Bobby Keys in Chicago and Blondie Chaplin in Germany and Norway. Keith Richards was attending the Bernard Fowler performance in New York City Tuesday May 19. See details about Keith Richards in attendance at the Knitting Factory NYC. Stones fans are upset about censorship as it is clear that Universal Records with or without purpose have released an edited version of "Star Star" on the 2009 remaster edition of "Goats Head Soup". See the details and discussion on the IORR forum thread Star Star censored on 2009 remaster. Mick Jagger will be recording a track with Joss Stone for a charity album that will be issued on the UN�s International Day Of Peace, September 21. Other artists said to be working on the record include U2 frontman Bono and rapper Nas. See the story Stones are back together by The SUN. Following the initial announcement last year, Universal Records have now announced details of the Rolling Stones re-releases. Most of the new releases will be as the originals, but "Exile On Main Street" will be released later this year, as part of wider plans for this title. See the complete Universal press release, and read comments from the fans on the IORR Tread Universal Records are to give 19 Rolling Stones albums a makeover "deluxe versions". Ronnie Wood has been confirmed as one of the guests performing with Slash and Friends at the Quart festival in Kristiansand, Norway on June 30. Other guests are Jason Bonham and Ozzy Osbourne. See details about Slash with Ronniew Wood at the Quart. Ronnie Wood has recorded about a dozen songs for a new solo album titled "More Good News". Producer Bob Rock confirmed that he worked on an as-yet-untitled track with Ronnie which features a guest appearance by Pearl Jam's Eddie Vedder. See the Billboard story Ron Wood Taps Eddie Vedder, Bob Rock For Solo Album. Ronnie Wood is among the artists scheduled to perform at a charity dinner/concert in Los Angeles, USA on May 8, to raise money for musicians struggling with addiction. The fifth annual MusiCares MAP Fund event will take place at the 2,300-capacity Club Nokia. Individual floor Seats are priced at $1,250 and preferred balcony seats at $100, sold through the organizers of the Grammys. Ticketmaster is selling general admission balcony seats at $50. Other performers at the alcohol-free event include Iggy Pop, the Mars Volta and Ivan Neville. Ronnie Wood jammed with Jimmy Page, Jeff Beck, Joe Perry, Kirk Hammett and James Hetfield at the Rock & Roll Hall of Fame in Cleveland, Ohio, USA last night. See reports by Daily Mail and The Cleveland Plain Dealer, and pictures plus more on the IORR Tell Me thread Pictures Ronnie Wood Roll Hall of Fame. The new It's Only Rock'n Roll magazine issue IORR 60 was mailed out to all subscribers last week, and should have arrived to everyone by air mail now. The magazine is including unique photos, interviews, reports and more. For information about how to subscribe see the Get IORR pages. Charlie Watts will be performing at the Tivoli Theatre in Wimborne, Dorset, UK as one of the guests of Ben Waters and Axel Zwingenberger on April 9th. Other guests include Chris Jagger. Also, Charlie will be guest performer with Ben Waters at the Bulls Head in Barnes on April 13. See announcements by The Tivoli Theatre and Ben Waters. Ronnie Wood will induct Bobby Womack at the Rock and Roll Hall of Fame in Cleveland, OH, USA on April 4. See the Billboard story Eminem, Jimmy Page, Ron Wood To Present Rock and Roll Hall Fame Inductions. Barnes & Noble are presenting a cartoon review of the Bill Gerrman book. See the Ward Sutton cartoon review of Under Their Thumb. Ronnie Wood joined Bernard Fowler and Blondie Chaplin on stage at the Joint in Los Angeles on Saturday, playing on "Little Red Rooster" and "Flying". See pictures and details on the IORR forum thread Ronnie Wood turned up at Blondie Chaplin's gig in LA. Ronnie Wood will be performing at the The 2nd Annual Right Turn Fundraiser "SUPERGROUP" at Berklee Performance Center in Boston, MA, USA on April 26. The Bill German book Under Their Thumb will be out in USA tomorrow February 24 in America, and on April 16 in the UK. There will be a book signing Thursday, February 26 7PM at Barnes & Noble, 106 Court Street, Brooklyn, New York City. Noted Stones fan Bill German, publisher of the Beggars Banquet newsletter, has written about his life and times in "Under Their Thumb: How A Nice Boy From Brooklyn Got Mixed Up With The Rolling Stones (And Lived To Tell About It)." It will be published on Feb. 24 via Villard Books/Random House. 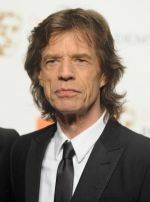 Mick Jagger presented the top prize at the Orange British Academy Film Awards show last night. Mick made jokes about being part of the Rock star-Movie star Exchange Program, Then he announced the winner of the BAFTA mask for best film of 2008 - "Slumdog Millionaire." See the UPI story Jagger leaves them laughing at BAFTAs. Ronnie wants to live in Los Angeles after falling in love with the city while he was there to record a new album with the reformed Faces recently. See the Yahoo UK & Ireland news story Ronnie Wood's LA escape. Keith Richards is supporting The Rector High School Helping Hands Foundation by donating a signed Zemaitis guitar for an auction. Bill Carter, who worked with the Stones in the 70's and 80's, co-founder of "Helping Hands", used his contacts to secure the donation. See the Clay County Democrat story: Music legends donate memorabilia for Helping Hands charity auction. A total of one million people visited IORR during 2008. Every person visited IORR an average of 3 times during the year. The visitors came from more than 190 countries i.e. all countries across the world. The top visiting contries are USA, Germany and UK. For details and comments see the IORR forum thread One million people on IORR during 2008.